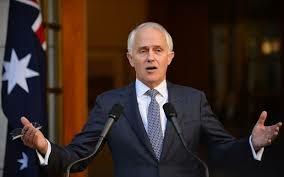 Australia is in the midst of a national election and the leader of the conservative party, (the Liberal Party in Australia), is Malcolm Turnbull. Turnbull ousted the elected prime minister, Tony Abbott, with a knife in the back supported by 54 fellow MPs just over 6 months ago. The takeover was justified by the fact that the Liberals at the time were behind in the polls, (because good government is about worshiping dodgy polling stats), and he sold himself on being the great communicator. Since the start of the Liberal’s unloseable election campaign they have plummeted in the polls and Turnbull has displayed the communication skills of a duck gargling brake fluid. He is losing the unloseable because he has no spine, no platforms, and no idea. His entire raison d’etre was to become the Australian prime minister. The problem is that he had no plan or any ideas for what would come on day 2. Now he has delivered a ramadan message for the start of the muslim holy month. For Muslims, Ramadan is the holiest month of the year – a time for charity, for remembering the less fortunate in society, and a time for personal reflection and renewal. No similar message was given at the beginning of Lent for all the Christians, Anglicans, and Orthodox members of the community. Muslims make up less than 2% of the Australian population but here we have the prime minister non-elect virtue signaling on a grand scale. To say that he and the majority of his party are out of touch with ordinary Australians is underestimating the extent of popular sentiment to levels only matched by the Neo-Cons in American politics at this time. Cuckservatives are in the USA, they are in Europe, they are in Canada, and they are most certainly in Australia. The Australian Liberal party are not just a light version of the opposition, (known as labor-lite), they are full blown cuckservatives ready to sell their country down the road to socialist welfare and invading unassimilable migrants. I predict that this election will see the decimation of the bases of the two main parties. Independents and new parties such as The Australian Liberty Alliance will bag a score of seats. The MSM talking heads and political pundits will be surprised and flabbergasted at this “unpredictable” result. With luck the new sitting government will have to negotiate with them for passage of legislation. The alternative is a national cucking. Would Hemingway be published today?